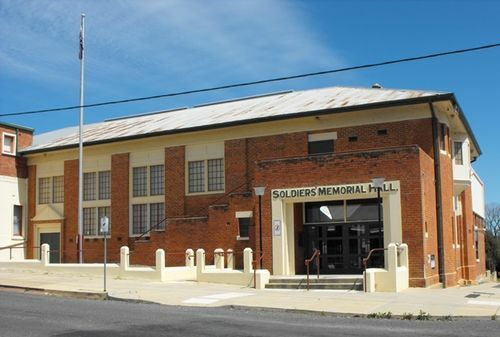 The Soldiers Memorial Hall was erected in 1926 to commemorate those from the district who served in World War One. 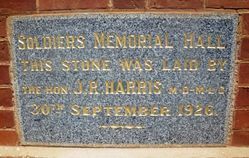 (From our Correspondent) The laying of the foundation stone of the Soldiers' Memorial Hall at Rutherglen took place on Thursday afternoon, Dr. Harris, M.L.C., performed the ceremony, using a silver trowel presented by the shire president, Cr. John Burch. The hall, which will be of brick, will be a handsome structure, 75ft. x 45ft., seating 600 people with council chambers adjoining, also shire secretary`s office, a room for returned soldiers' meetings, large supper room, kitchen, and two cloak rooms. The cost of the building will be about £8000, of which amount over £2000 was raised by means of a queen competition. The school children were given a half holiday and presented with a bag of sweets each, and the adults were entertained by the shire president at afternoon tea. The old town hall was erected 60 years ago. Albury Banner and Wodonga Express (NSW), 8 October 1926. The Hon. J. R. Harris M.D. M.L.C.